'Supergirl' returned from an extra long break to bring one of the better episodes of the season that showcased Winn, his evil villain dad the 'Toyman,' some great Hank heroics and Maxwell Lord being shady as ever. The show opens with a devilish introduction of Winslow Schott, Sr., escaping from prison rather easily with a deadly yo-yo. If you were worried that the Winslow Schott that works with Kara at CatCo was the future Toyman well this episode laid that theory to rest. Instead, Winn Jr is the son who lost his otherwise caring dad to his father's acts of terrorism that jailed him. Winn has no problem helping the FBI capture him. 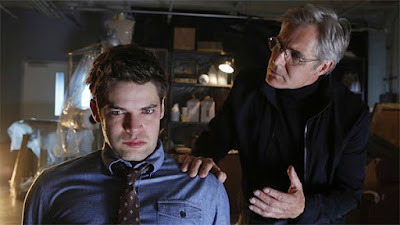 Jeremy Jordan does a wonderful job of conveying his inner turmoil dealing with his feelings for his father and for Kara. While confessing his fears and hopes of not wanting to follow in his dad's deadly footsteps, he reveals his feelings for Kara resulting in a very awkward kiss. It's an emotional scene that works better than any of the whole Kara/James/Lucy love triangle ever has. Jordan finds the depth of Winn's tempest of emotions to attempt a connection with Kara even if it was misguided. I'm not sure what was the point of Cat offering Lucy a job at CatCo other than to create some conflict between James and Lucy. James obviously doesn't want her there while he harbors some feelings for Kara. I'm not sure the writers know what to do with Lucy. She's been the roadblock keeping James and Kara apart but there's got to be something more substantial for Lucy to do than be a plot device. Hank's revelation as the Martian Manhunter has really changed the show's dynamics at the DEO. What was once a drab generic government agency is now the home of reluctant superhero J'onn J'onnz. His protests of not wanting to use his powers because somehow he can do more good as human (as if) doesn't last long. Seeing him and Kara flying around was a special treat any fan of DC Comics could appreciate. I never thought I'd see that on TV. Henry Czerny has made a career of playing shady, corrupt, and morally flexible characters and he brings a lot to Toyman. His earnest and calm portrayal of a madman who really loves his son despite his twisted moral compass keeps it from going completely into campy 1966 'Batman' mode. It was a great modern homage to the comics with his deadly toys disguised as bombs including several dolls directly from the source material. It wasn't without some silly moments of course. The methods Toyman uses to trap Supergirl don't make sense and the way she saves everyone at the Toy convention (where else?) doesn't hold any water. Yet, the rewarding scenes apart from Winn with Kara are the ones at the end. Kara and Alex sit down to watch 'Game of Thrones' and eat pizza while discussing Kara's day. I love to see them bonding as sisters instead of superhero and sidekick. 'Childish Things' was an especially enjoyable episode that moved things along nicely while giving Winn some important character development. Seeing Hank reluctantly use his powers has become a treat and a welcome turn, expanding the superhero quotient on the show. And it wouldn't be a 'Supergirl' episode without a major cliffhanger and Lord spying on the Danvers girls to find out Alex's sister is Supergirl should raise the stakes going forward. "Strange Visitor From Another Planet" - Kara must help Hank face his painful past when a White Martian, a member of the alien race that wiped out his people, kidnaps Senator Miranda Crane (Tawny Cypress), an anti-alien politician. Also, Cat’s estranged son, Adam (Blake Jenner), arrives in National City, on SUPERGIRL, Monday, January 25th on CBS.